Some developers of autonomous vehicles have published their safety guidelines in the past months – some of them on a voluntary basis – and now some other vendors are joining the ranks. 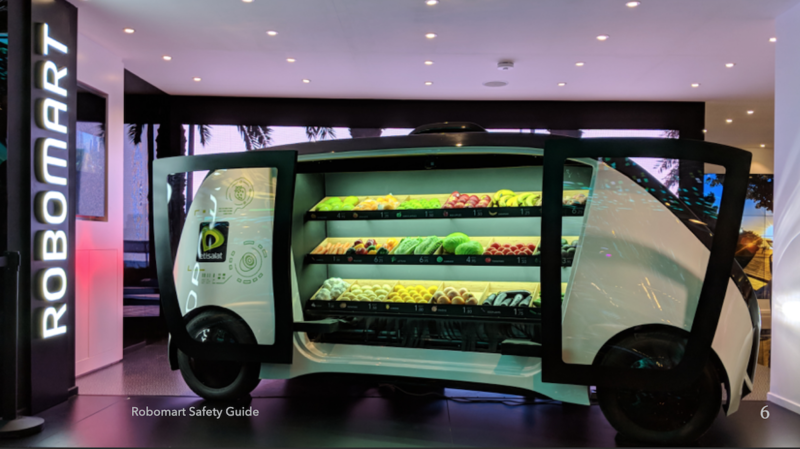 Robomart, a startup developing fully autonomous grocery stores, is soon starting tests with its delivery robot that can be ordered via smartphone app and brings groceries to your front door. The safety guide prepared for the NHTSA discusses several safety aspects. The vehicle measures 11.5 in length, 5.5 feet in height and 4.7 in width. The electric vehicle can load up to half a ton of groceries. The maximum speed is 25 mph, and the vehicle is equipped with LiDARs, cameras, and radar. the vehicle can also be remote controlled from a teleoperation center. it is not designed to transport passengers and operates within a geofenced area.. The full safety guide can be downloaded here. Thanks, that’s interesting. The link somehow doesn’t work for me, can you double check? Link is corrected, sorry for that!